You may download this lecture as Adobe Acrobat PDF file (258 KB) following the link bellow. A series of recently published explanations of ventricular structure and function, have finally shed a new light on this and many other very important issues. Current knowledge of the unique ventricular structure and functional relationships (presented at the NIH-NHLBI Workshop: ‘Form and Function: New Views on Disease and Therapies for the Heart’, April 25–26, 2002, Bethesda, MD), urges for reconciliation of some exceeded concepts in cardiovascular basic science and clinical practice. Here I will expose some experimental evidences and theoretical backgrounds, which could be useful in understanding the physical (mechanical) phenomena, governing ventricular systolic and diastolic functions. Biological hysteresis cycle (i.e. natural tendency of any object to recover its previous form) within the ventricular myocardium is sustained by successive shortening and lengthening phases, occurring at different organizational levels, from subcellular entities - to the whole organ. In the mathematical and biological world, this principle of "self-similarity" (as the fundamental part of fractal design theories), is well described and applied in ongoing attempts to create an integrative, "physiomic" approach in analyzing complex structural and functional relationships within one organ or system (Physiome project web site). Substantial progress has been done recently in elucidating subtle relationships at cellular and molecular levels, but only with the discovery of the ventricular myocardial band (VMB), it became clear that unavoidable coherence and mutual coupling of form and function exist in the entire ventricular myocardium. With this new basic knowledge, it is now possible to understand the principles behind electrical, mechanical and energetical events within the human heart. The architectural organization plan of the ventricular myocardial fibers is represented by the VMB, which describes two spirals in the space, during its trajectory from the pulmonary artery to the aorta, defining a helicoid, which delimitates two cavities, the right (RV) and the left ventricles (LV)(Figure 1). in the AL, the descendent segment (DS) with fibers coming down from the ventricular base to the apex . With the term "hysteresis", taken from the Greek, is made reference to the time passed between the moment in which incides a cause and the moment in which takes place its effect. At present, nevertheless, this word is more used to design the phenomenon by means of which the configuration and characteristics of an object depends of its previous state or condition. The recuperation of the initial form of a springboard, which becomes curved when on its free end a bather remains standing up, is obviously, determined by the rectilinear form adopted when it is not used. Such a concept can be also applied to the de-formation and re-formation of the spherical configuration of a rubber ball, to the shortening and lengthening changes of a steel spring, etc, giving rise to correspondent cycles of hysteresis. 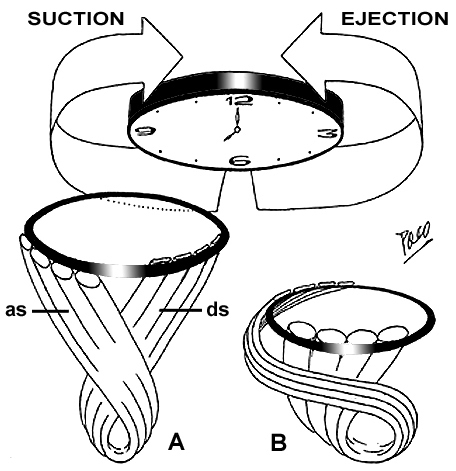 When an elongated rubber piece is lengthened (Figure 3), pulling from its both ends by means of a simultaneous traction with two strings, it becomes deformated, with an increase of length and a decrease of thicknes, adopting a curved form, when it adapts to a more or less circular fixed object. It is evident, when the traction stops, that an intrinsic endogenous energy, of an elastic nature, acts then to return that piece to its initial configuration. 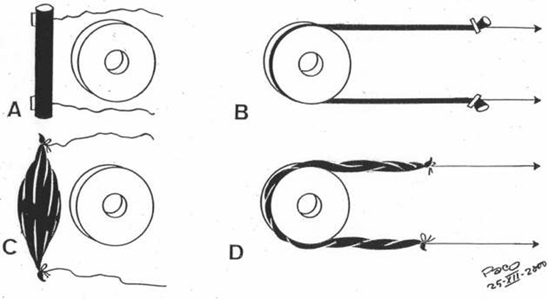 But quite a different thing happens when, instead of a rubber object, the traction is made on a muscle (Figure 3). When a simultaneous traction acts on both ends of the muscle - it is elongated, but when such traction stops - the initial form could not be recovered spontaneously. Only by means of an electrical stimulation, which originates a contraction, that initial form can be recuperated. Evidently, the electric stimulus is an exogenous energy that, coming from outside, is extrinsic to the muscle. When an arm is stretched out, its biceps is isotonically relaxed, remaining lengthened, without being possible to recover its initial form by itself; but only by means of a stimulus coming from the brain (voluntary action) or from the spinal cord (reflex action), which gives rise to a contraction and the recovery of the initial configuration. It can be said, therefore, that to produce a de-formation, as the lengthening of the rubber piece and the muscle, it is necessary a force coming from outside. Meanwhile, to produce a re-formation (word use in the sense of recovering the previous form), is needed an intrinsic energy or an extrinsic energy. the extrinsic hysteresis (i.e. false hysteresis), as that one seen in a muscle. But in the recuperation of the initial form of the two objects (Figure 3), there is one common fact. No matter the so deep difference between the elastic and electrical energies, respectively used for each one of them to recuperate their initial configuration, in both cases such recuperation gives rise, simultaneously, to an stiffening of the rubber piece and the muscles, by means of which, their initial curvature (i.e. adopted as a consequence of the curvilinear traction), disappears. The understanding and explanation of such stiffening is very important. Any action, repeatedly performed by a given muscle, implicates the opposite action, usually afterwards developed, by the other muscle. If not so, any muscular activity only could be done once. In this way arises the concept of agonist and antagonist muscles (clearly understandable for the skeletal mucles). The reiteration of a movement, to perform some mechanical work peculiar of a living being (e.g. to walk, to ruminate, etc. ), comes conditioned by the alternant activity of two muscles, agonist-antagonist, in which each component relaxes the other isotonically, by lengthening it. It is not adequate, therefore, to think that the agonist and antagonist muscles are opposed, perpetual adversaries, as the etymology suggests (i.e. the word "agonist", taken from the Greek, means "combatant"). The agonist muscle does not "fight" against the antagonist one, since usually, they do not act at the same time. On the contrary, what the agonist does, is to help to the antagonist lengthening it, to produce it's isotonic relaxation. And, vice versa - the same could be said of the antagonist muscle. It can be affirmed that the motor of the blood circulation is the heart, meanwhile, the motor of the heart are the ventricles. Moreover, the motor of the ventricles is the AL, by means of the contraction of its two segments: DS - which acts as an agonits muscle, pulling down the BL; and the AS - which acts as an antagonist muscle, pushing up the BL. It can be said that the heart work is also strictly ruled by an agonist-antagonist functional dualism. It is so because the agonist contraction of the DS originates a decrease of the ventricular cavities volume (pulling down the ventricular base toward the apex), giving rise to the ejection of blood to the pulmonary artery and the aorta, meanwhile, the antagonist contraction of the AS originates an increase of the ventricular cavities volume (pushing up the ventricular base from the apex), giving rise to the suction of blood from the atria and pulmonary veins. The double function of the heart - the ejection of blood to the arteries and the suction of blood from the veins (atria) - is performed by means of a respective shortening and lengthening of the ventricles (Figure 4). When the ventricles shorten - the volume of the ventricular cavities decrease, and when they lengthen - the volume of the ventricular cavities increase. A respective decrease and increase of the ventricular wall thickness is added to these shortening and lengthening movements, to collaborate in volume changes within the ventricular cavities. The shortening and lengthening of the ventricles takes place thanks to a respective descent and ascent of the ventricular base. This may seem as a paradoxical fact, since the base (because of its anatomical relations), is tide to the atria and to the aorta and pulmonary artery, meanwhile, the apex (quite free), remains practically motionless during all the cardiac cycle (Figure 5 - animated gif). Purkinje (1843) had described this fact in his observations of "punctum fixum" and "punctum mobile". He explained that the apex of the heart remains motionless, while atrioventricular junction moves toward and from it during ventricular systole and diastole, respectively. Later on (1935), this fact has been proved cinematographically by Benninghof. The shortening and the lengthening of the ventricles, which are producing the decrease and the increase of the ventricular cavities volume, are performed by means of a correspondent torsion and untorsion movements of the ventricular myocardial mass. These facts have been proven experimentally with MRI tagging. The torsion squeezes the ventricular mass, decreasing the ventricular volume and it could be thought, in principle, that the untorsion could give rise to an enlargement of the ventricular cavities. But it is not true. The untorsion does not implicates any increase of that volume. 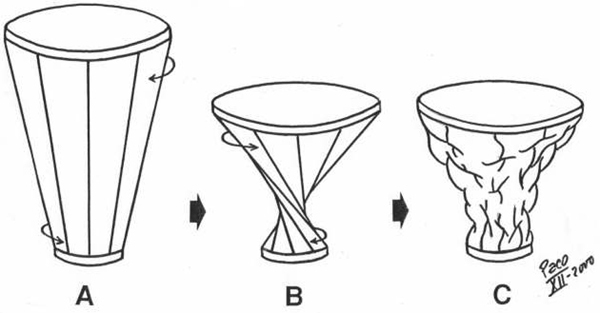 As it is shown in Figure 6, the torsion of a frustum implicates, necessarily, its shortening, with an evident decrease of its volume. The untorsion, meanwhile, can take place without any lengthening. In other words, during the torsion - the two basis of the frustum always get nearer one to each other. But for the untorsion - the separation of frustum´s bases is not neccessary condition. In Figure 7, an elastic piece (in black) is represented on a flat surface. One end (y) is fixed meanwhile the other end (x), is free. Such piece can be elongated, making a traction from its free end to confer it a rectilinear (B) or a curvilinear (C) configuration, and, afterwards, shortened, upon releasing the free end (x). To contract and produce a work, any muscle (or any part of it) must be previously lengthened (isotonic relaxation) in a rectilinear way, pulling in an opposite sense it´s two ends. The muscular contraction that follows a rectilinear lengthening - is agonist, meanwhile, any muscular contraction that takes place after a curvilinear elongation - is antagonist. In the rectilinear traction (Figure 7), in which the rubber piece is elongated until a determined length, the free end x changes its position from level b to level c. If the traction finishes then, the end x comes back to the level b, recovering the initial configuration by means of a movement with a unique component - shortening. But if the elastic piece (Figure 7) is elongated, leaning it on a fixed point of support, a curvilinear configuration is then adopted. Because of that, the free end (x) comes from the level b to the level a. If, at this moment, the traction stops - the free end (x) returns immediately to level b and the initial configuration is recovered, by means of a movement with two components - a shortening and a simultaneous stiffening. It can be said that such stiffening is due to it's elastic nature, and that is true. A piece, elongated in a rectilinear or curvilinear way, recovers its initial configuration, due to the intrinsic hysteresis cycle. But if such piece is substituted by a muscle - the recuperation of the initial configuration could never be observed, because the muscle does not posses the same internal elasticity to do it, as the rubber ball does. The muscle needs an energy or force (electrical stimulus), coming from outside, to contract and to recover its initial configuration (i.e. the extrinsic hysteresis cycle should occur). But both cycles of hysteresis, the intrinsic one and the extrinsic one, have something in common - and that is a stiffening - a fact by means of which the initial configuration of the rubber piece and the muscle is recovered. In the organism, there are many cycles of extrinsic hysteresis developed by correspondent muscular pairs (i.e. agonist-antagonist). 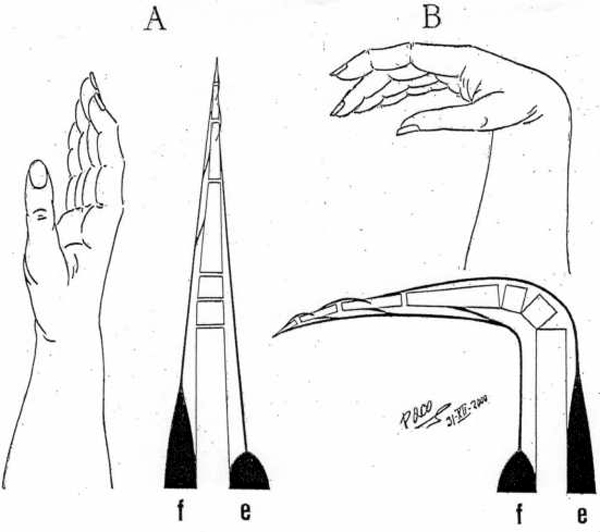 A representative example is that one of the flexor and extensor muscles on the hand fingers (Figure 7b). One hand in extended position, becomes flexed, due to rectilinear contraction of the flexor muscles (agonist). As a consequence, the tendons of the extensor muscles become incurvated on the radial epiphysis, which presents a fixed point of support on which those tendons lean. Accordingly, when the extensor muscles (antagonist) contract, the hand comes again to the position of extension. Due to this fact, the flexor muscles are elongated (isotonic relaxation), and remain ready to contract again. Evidently, the flexor muscles (agonist) could never, on their own, recover the initial elongated configuration without the action of the extensor muscles, et vice versa. Therefore if the hand is flexed, the contraction of the extensor muscles cause it´s ascent. It may seem as a paradox, since this ascent is possible only after previous descent (produced by shortening of the extensor muscles when they contract). The contraction of the extensor muscles (antagonist), which has been previously elongated in a curvilinear way, gives rise to the above mentioned stiffening - a fact that is a mere particular application of the lever principle. In a lever - resting on a fulcrum - a movement of the one end, implicates an opposite movement of the other end of the lever arms. Such a simple mechanical phenomenon, as described above, could explain how does the increase of the ventricular volume could be achieved by the contraction of certain (antagonist) myocardial fibres. Those fibers are belonging to the AS of the VMB-AL. Development of any muscular contractile activity is a function with a foreseeable result, depending on the predominant direction and spatial arrangement of constitutive muscular fibers. Within a helicoid configured by VMB, it is possible to distinguish the four above-mentioned tracts (VMB segments), whose respective fibers adopt different directions along the VMB trajectory. This fact gives rise to a correspondent, specific mechanical result, when each of them contracts in a successive manner during the cardiac cycle. Accordingly, these four segments can be functionally individualized through the different actions they perform during contraction. Therefore, it must be noticed that four segments of the VMB have pronounced functional, rather than morphological personality. Respecting the evident coherence between the form and the function, which always exists in any organ, the double action performed by the ventricles (i.e. the ejection and the suction of blood), could now be explained by means of the above-described structure. The underlying mechanism of ventricular function could be roughly compared with mechanical performance of an internal combustion motor engine (Figure 8). The BL in that case represents a cylinder, meanwhile the AL would correspond to a piston. In spite of such morphological correspondence, there is a fundamental difference between the ways by which heart and motor engine perform their functions. This difference comes out from the earlier mentioned Purkinje’s observations. In the motor engine, the cylinder remains motionless during each working cycle. On the contrary, in the heart, it is the cylinder (Figure 8), represented by the BL, that moves up and down in each cardiac cycle. But, it must be said that the BL does not simply slides as a mobile metal cylinder slipping on the AL (as it will be explained later). It comes up and down accompanying the AL when it lengthens and shortens, respectively. In other words, it happens so with increase and decrease of the ventricular volume during each cardiac cycle, as it was clearly demonstrated by MR imaging of a beating heart in a longitudinal plane. Thanks to the incontrovertible results provided from experimental electrophysiological studies by Cox et al. and to the reports on fast Fourier analyses of gated blood pool ventriculography by Flotats et al., (Figure 9) it is evident that the RV free wall (i.e. the BL-RS) is the first region of the ventricular mass to be excited in each cardiac cycle. Since the excitation and consecutive contraction waves preferably follow the longitudinal axes of the myocardial fibers (cellular and tissue levels), as shown by Robb and Robb and others, accordingly, it is evident that such progression will occur necessarily along the successive VMB segments (the whole organ level). At the beginning of the classical systole (i.e. isovolumetric phase), successive contraction of the RS and LS, respectively, give rise to a tight embracement of the AL and consecutive increase of the intra-cavitary pressure. Although this kind of "belt action" performed by the BL does not produce a significant decrease of the ventricular base inner diameter (because at this time, the ventricles are filled up with incompressible blood and the AV valves are closed), it does support and facilitate appropriate coaptation of the AV valve leaflets and the efficient closure of tricuspid and mitral orifices. This fact has been recognized, using different imaging techniques, as the initial change in size and shape (perimeter and area) of the AV orifices, with the onset of systole. Contraction of the DS (Figure 10), as shown by tagged MR imaging, produces three simultaneous actions: shortening of the ventricular longitudinal axis, counterclockwise rotation (viewed from the apex) of the ventricular base and additional change in size and shape of the AV orifices. These three actions are causally related with particular spatial arrangement of the DS fibers at the onset of their contraction. Namely, due to their predominant verticality, ventricular base is forced to descend toward the motionless apex, thus producing a longitudinal shortening of the ventricular mass cone. Their slight obliquity gives rise to the counter-clockwise rotation of the ventricular base, which implicates a torsion of the ventricular mass cone (like "wringing the wet towel or cloth", as been described long ago by Borelli, or like "squeezing a lemon" as understood by 5 years old Jonathan Corno, a marvelous son of Antonio Corno). Finally their conicity, pertaining to the conical form of the entire ventricular mass (enforced by previous belt action of the BL), causes the consecutive reduction of the ventricular base dimensions and shape, since it is forced to descend toward narrower, apical part of the cone. It is obvious that these three actions of the DS (together with earlier actions of the BL), could produce an efficient ejection of blood to the great arteries. Finally, the ultimate part of the VMB that enters contraction during the cardiac cycle is the AS (Figure 10). This segment is a key for understanding all those "secret forces" (commonly mentioned in literature) that are responsible for the ventricular filling. Before any further explanation of AS mechanics, it is important to realize some anatomical facts and physical principles (the last being recently described in detail and incorporated in forthcoming elegant mathematical model, created by the research team of Prof. Morteza Gharib at Californian Institute of Technology). From the anatomical point of view, it is important to notice two facts. The first one is that the length of the AS is greater than that of the DS; and the second one is that the degree of radial inclination (i.e. obliquity) of the fibers, pertaining to the AS (even in a completely reposed ventricular myocardium), overcomes that of the DS. The second fact is a direct consequence of the previous one, keeping in mind that both segments are wrapped around dynamic fulcrum represented by certain volume of blood, which is always present inside the ventricular cavities. Therefore, the intra-ventricular blood does not only passively sustain forces generated by the surrounding myocardium, but also provides a support to it (as a fulcrum) in generating such forces. Because of this interdependence, the term "hemoskeleton" was introduced to describe this specific role of the intra-ventricular blood. And really, it is more than evident from the clinical practice, that different loading conditions (i.e. dynamic changes of the hemoskeleton), have a great influence on ventricular performance. From the physical standpoint, it is important to realize that dynamic hemoskeleton, applying the principles of the first class lever, could change the mechanical efficiency of contracting myocardial fibers by altering the distance and proportion of the curvilinear lever arms. The term "dynamic", used here to describe the hemoskeleton, emphasizes that the support it gives to surrounding myocardium, varies according to consecutive changes of intra-ventricular blood volume (i.e. fulcrum radius) during the cardiac cycle. In general, the bigger the hemoskeleton, the smaller the lever effect and vice versa. Specific spatial arrangement of the DS and AS fibers and the presence of dynamic hemoskeleton, impose their complex interplay during the hysteresis cycle. 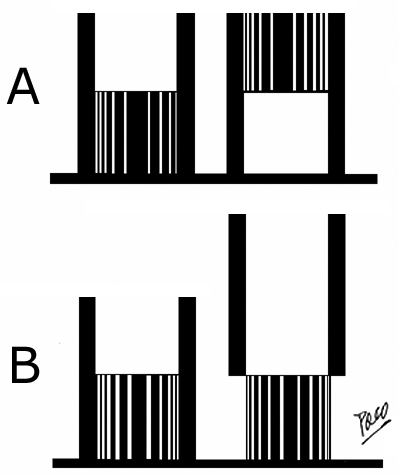 Verticality, obliquity and conicity, although not equally represented, could be regarded as the common denominations for both DS and AS fibers. Predominant verticality in DS and obliquity in AS fibers, along with their X-crossing within the AL, evidently explain the opposite effects produced by their respective contraction. Therefore, prior to its own contraction, the AS sustains progressive elongation by ongoing contraction of the DS (Figure 10). As mentioned above, predominant longitudinality of the DS fibers, along with presence of initially large hemoskeleton (i.e. end-diastolic blood volume), results in abrupt downward displacement of the ventricular base. At the same time, initially small but (as the ejection of blood progresses) increasing obliquity of the DS fibers, gives rise to counter-clockwise rotation of the ventricular base. This movement, apart from its "wringing" effect, increases the curvilinear distension of the AS to the maximal point, in which the hemoskeleton is represented by the residual blood volume inside the ventricular cavity. At this moment, the AS segment starts its own contraction. Here, it is of utmost importance to realize two facts. The first one is that predominant obliquity of the reposed AS has been additionally increased during previous contraction of the DS. The second one, that forthcoming contraction of curvilinearly distended AS, utilizes as a fulcrum the smallest possible hemoskeleton (i.e. residual blood volume), thus attaining the maximal efficiency from the lever mechanism. Therefore, the contraction of the AS necessarily implies simultaneous shortening and pronounced rectifying of its fibers (Figure 10). This kind of active biomechanical performance could explain an almost paradoxical fact: ventricular elongation, promoted by muscular contraction. Putting all these observations together, the contraction of the AS produces three simultaneous actions: abrupt lengthening of the ventricular longitudinal axis, clockwise rotation of the ventricular base, and increase in size and change in shape of the AV orifices. As a net result of these actions, ventricles are rapidly increasing their volumes, and with all valves being closed during that time, a powerful suction force for the atrial blood is thus generated. As shown by Katz in 1930, the fact that intraventricular pressure drops (dP/dt<0) even during the rapid filling phase, clearly points out that it has to be preceded by a large and rapid increase of the ventricular volume (dV/dt>0); capable of producing the effective suction force (dP/dV<0): Now, it is evident that such increase of the ventricular volume is produced by the contraction of the AS. Another important question pertains to the chronological location of the AS contraction during the cardiac cycle. The contraction of the AS starts at the summit of the ventricular pressure curve and finishes at the end of the suction phase (i.e. rapid filling phase in classical conception). And really, the effects of the AS contraction, fulfill the etymological criteria defining diastole (i.e. augmentation, lengthening). But, in fact, the actual mechanism by which the AS attains it's effects - is the muscular contraction. Since the systole has been considered as a synonym for muscular contractile activity, applying this criterion, AS contraction could be regarded as a systolic event. Accordingly, it is clear that the ventricular filling is an active phenomenon, performed by the muscular contraction of the AS fibers. Therefore, it is very important to realize that healthy heart possesses strong capacities (defined by specific spatial arrangement of the VMB segments) to ensure its own efficient emptying (systolic function) and filling (diastolic function), by means of successive muscular contraction along the VMB. Since the first ideas about chronology of mechanical events, presented by Wiggers (1915), and later on assembled in the first description of the cardiac cycle, by Lewis (1920), there were many attempts to incorporate new knowledge in the old frame (Mejiler and Brutsaert in 1978, Zile 1989, Gillebert 1994). Although many clinicians believed that those efforts have had merely academic or didactic relevance, each day, more and more of them are changing this attitude. Two decades long, and yet fruitless efforts in resolving diastolic heart function (and failure), along with many other similar examples, have been the main reasons for such turnover. After anatomical and functional explanations given here, it is almost natural to incorporate them in the logical sequence of the mechanical events, during the cardiac cycle. 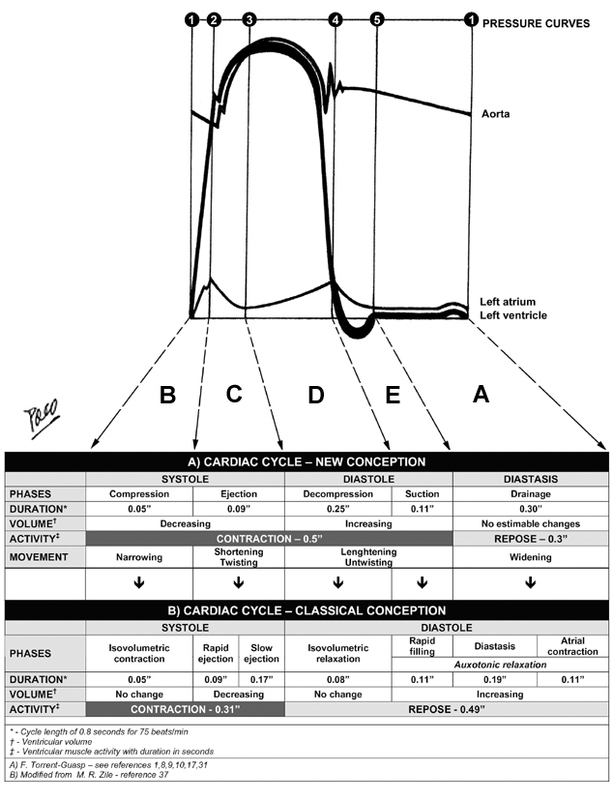 The classical conception about cardiac cycle is presented together with the new one (Figure 11), in order to make easier understanding of crucial differences between them. Successive contraction and relaxation of the VMB segments, produces several fundamental movements of the ventricular mass: narrowing, shortening (with torsion or twisting), lengthening (with untorsion or untwisting) and widening. 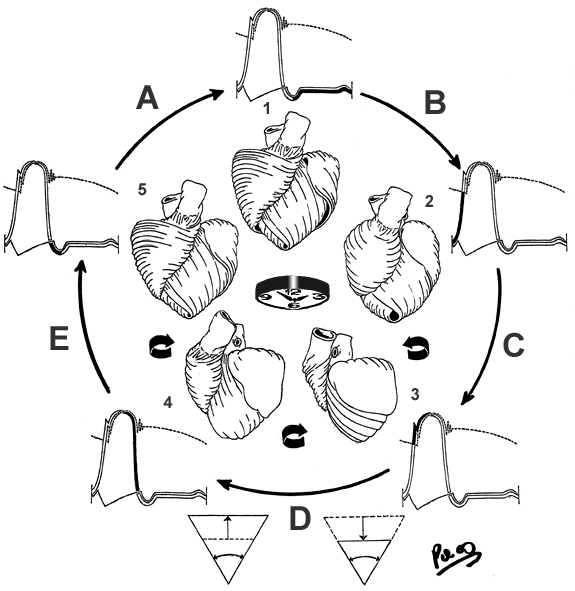 Chronological correlation of those movements with the successive phases of the cardiac cycle refers to Figure 12. During the cardiac cycle, ventricular wall also undergoes thickening and thinning. Both phenomena belong to the same hysteresis cycle, representing not only changes in single myocite diameter, but also the specific kinematic interaction between the contractile and elastic element within the ventricular wall. This phase starts at the end of diastole and runs until the first increase of the ventricular pressure finishes (black thick line at the LV pressure curve - diagram 2). The initial pressure increase is produced by the transversal, centripetal NARROWING of the base of the ventricular cone. This movement occurs due to successive contraction of both segments of the BL (RS and LS). 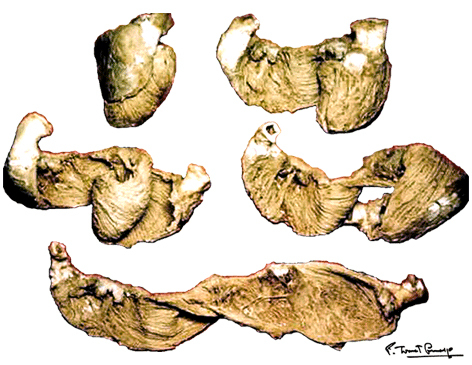 As a consequence of this BELT ACTION OF THE BL, occurs an abrupt apex dilatation, since at that time, the apical region is still relaxed. The “apex beat”, produced in this manner, could be easily felt on the anterior thoracic wall. PHASE. The term “isovolumetric”, in fact, does not reflect the reality, since the increase of pressure, registered during this phase, as an incontrovertible condition, requires a certain (even slight) degree of ventricular volume decrease. This phase starts at the end of the compression phase and runs along the second increase of the ventricular pressure, up to its summit (black thick line at the LV pressure curve - diagram 3). This pressure increase is produced by SHORTENING of the ventricular cone, due to a descending movement of the ventricular base (see adjunct triangle to diagram 3). This movement occurs due to the contraction of the DS. Because of its spatial orientation, contraction of the DS simultaneously produces a COUNTER-CLOCKWISE ROTATION of the ventricular base, which in turn, gives rise to aTORSION OR TWIST of the entire ventricular mass. The ejection of blood to the aorta and pulmonary arteries, takes place during this phase. In the classical concepts: this period is considered as the RAPID EJECTION PHASE. It is believed that, during this phase, ventricular cavity suffers significant constriction (i.e. transversal shortening) in order to eject blood. This “optical illusion”, appearing on transversal plane MRI, is produced by the reduction of the height of the ventricular mass cone (due to its descent toward the apex). As a proof of this statement, it has been observed on MRI, that the angle of the ventricular cone vertex remains constant along entire cardiac cycle. This phase starts at the end of the ejection phase and runs until decrease of the ventricular pressure reaches the atrial pressure level (black thick line at the LV pressure curve - diagram 4). This pressure decrease is produced by PARTIAL LENGTHENING of the ventricular mass cone, due to initial ascending movement of the ventricular base (see adjunct triangle to diagram 4). This movement is a consequence of the initial contraction of the AS. Because of its spatial orientation, contraction of the AS, simultaneously produces an INITIAL CLOCKWISE ROTATION of the ventricular base, which in turn, gives rise to PARTIAL UNTORSION OR UNTWIST of the entire ventricular mass. During this phase, the residual volume of blood within ventricular cavities is released from any myocardial compression. In the classical concepts: this period encompasses the SLOW EJECTION PHASE AND ISOVOLUMETRIC RELAXATION PHASE. Similarly as previous, the term “isovolumetric” does not suit the reality, since the decrease of pressure, registered during this period, neccessairly implies certain level of increase of the ventricular cavities volume. This phase starts at the end of the decompression and runs until the end of the second, successive increase of the ventricular pressure (thick line at the LV pressure curve - diagram 5). The pressure decrease in suction phase is produced by COMPLETE LENGTHENING of the ventricular mass cone, due to the final ascending movement of the ventricular base (see adjunct triangle to diagram 4). This movement also occurs due to the contraction of the AS. Because of its spatial orientation, the AS simultaneously produces the FINAL CLOCKWISE ROTATION of the ventricular base, which in turn, gives rise to COMPLETE UNTORSION OR UNTWIST of the entire ventricular mass. During this phase occurs an active suction of the blood from the atria. In the classical concepts: this period is considered as the RAPID FILLING PHASE. It is said, that during this phase, occurs significant transverse enlargement of the ventricular cavities. But, as explained earlier (now in the contrapose), this is also an optical phenomenon evident on MRI, produced by the ascending movement of the ventricular base along its conical path. The drainage phase, occupying the whole diastasis period, starts at the end of the suction phase and ends when atrial contraction occurs - just before the next compression phase (black thick line at the LV pressure curve - diagram 4). Low and uniform pressure during this period, is a result of complete RELAXATION AND REPOSE of the entire VMB. The WIDENING of the ventricular cavities, started with AS contraction in previous phases, is thus completed. Since the ventricles have been already filled up with blood, passage of the blood from the atria in this period is reduced to neglectedly low levels. In the classical concepts: this period belongs to the diastole, and is designated as DIASTASIS PHASE, which precedes ATRIAL CONTRACTION PHASE. The term “diastasis” (from Greek: “dia” – to go through, and “stasis” – stagnation) seems very appropriate, since it describes an interruption of the atrio-ventricular blood flow during this period. Nevertheless, it can be accepted that there is a slow dripping of blood during diastasis. The contribution of the atrial contraction to ventricular filling, even according to the classical conceptions, is disputable. Mechanisms responsible for the ventricular filling have been, for a long time, very difficult to understand and explain, even with the present knowledge of the VMB. It was fully accepted that left ventricular filling is facilitated by negative (suction) pressure, produced in the normal LV. But what does produce it? And how? The forces, capable of generating such a powerful suction, have been attributed to many logical and other reasons. Kinematic interaction between the elastic and contractile element within the ventricular wall has been considered, so far, as a mayor source of diastolic suction forces. Sysyolic myocardial contraction, decreasing the ventricular volume below its equilibrium levels, poduces the elastic deformation of the collagen network. There are oppinions that potential energy, stored in stretched collagen fibers, could appear as powerfull elastic recoil force, in the second phase of the hysteresis cycle (i.e. during the diastole). Although this possibility sounds logical, there are numerous anatomical and functional data which make it hardly acceptable. Myocardial collagen network arrangement (endo-, epi-and perimysial fibers) and function, in different loading and contractile states, has been nicely described by LeGrice. But, ventricular elastic “machinery” does not exclusively pertain to the myocardial matrix. Recent insights in specific role of intracellular and sarcomeral proteins (e.g. titin and others), have elucidated their importance in contractile and elastic kinematic interaction. This interaction is essential for the uniform distribution of stress and strain within ventricular wall, which, in turn, maintains the structural (and functional) stability of the sarcomere. And really, it has been proved that remarkable uniformity of sarcomere length (2.25µm - 1.5 µm) exists in the individual, as well as in adjacent myocytes. Whit sarcomere shortening capacity of 10% to 20%, the heart is able to produce the ejection fraction of up to 60%, and systolic wall thickening of up to 30%. It is obvious, from those facts, that some kind of amplification factor has to be involved in this functional augumentation during the systole. Spatial organization of VMB segments, their sequential activation and interaction with dynamic haemoskeleton, utilizing the principles of lever, explains the anatomical and mechanical background, applied in this functional amplification. It was also estimated that <50% of normal systolic wall thickening, could be explained by the increase of myocyte diameters, and that >50% of it, occurs due to the transverse shear (“slippage”) along myocardial cleavage planes (layers). The reports on estimated percentage of systolic wall thickening, varies according to methodology applied. 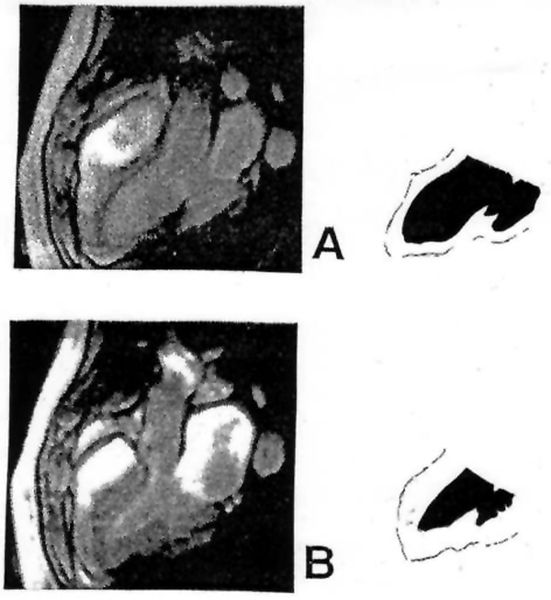 Overestimation of this systolic phenomenon, using MRI analyses, as mentioned earlier, could be explained by the descending movement of the BL along the ventricular mass cone (see adjunct triangles to diagrams 3 and 4 on figure 6). Furthermore, Hexeberg has shown a significant transmural anisotropy of thickness, between different layers, during the systolic contraction. He has proved that thickening of the distinct myocardial layer, does not only reflect the work performed by its constitutive fibers, but also, the work of all other transmural layers. Those observations are also concordant with architectural plane and sequential activation of VMB segments. Therefore, the thickening of the ventricular wall during the systole, appears to be a consequence of several factors, occurring during successive, longitudinal contraction along VMB. Histological arrangement of the myocardial fibers and layers (i.e. their trhee-dimensional structure, achieved by interconnection of the cardiomyocite lateral anastomotic branches), clearly defines the limits of both thickening and thinning within particular layer, during the longitudinal slippage of its fibers. This limitation is also applicable on collagen network, surrounding the contractile elements. As a consequence, elastic deformation forces, generated within the ventricular wall, do not posses a kinetic capacities, comparable with those generated by active muscular contraction. The best evidence of this statement is the velocity of the ventricular filling, which could not be explained by slow, passive elastic recoil. Such a powerful (and fast) force may only belong to the muscular contraction. Moreover, even this conclusion may be insufficient in understanding the efficient ventricular filling during the extremely fast heart rates. Further steps in ongoing research of the electrical transmission along the VMB, could offer some explanations in a near future. Muscular origin of diastolic suction, since earliest Galenic observations, has been advocated and denied, from time to time. Ongoing debate about ventricular long axis function, in the recent literature, indicates that numerous investigators have indirectly proved the muscular (active) origin of the ventricular suction filling, even without any intention to do so. Most of them did so by observing systolic and diastolic behavior of the LV long axis on echocardiography.